In 2000 Cornwall Borough completed the project of updating its Comprehensive Plan. The new Plan included recommendations for additional regulations related to the preservation of natural amenities in the Borough, as well as a proposal for creation of a “Planned Development” zoning district in the western portion of the Borough. In order to implement the goals of the newly adopted Plan, the Borough contracted Hanover Engineering to assist in updating its Zoning and Subdivision and Land Development Ordinances. 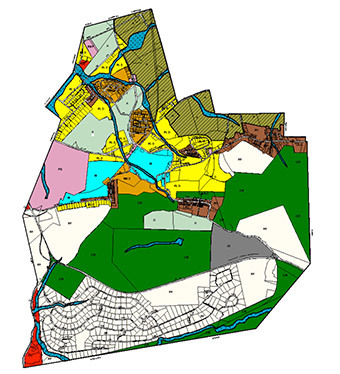 The Zoning Ordinance was updated to include several “overlay” zoning districts, which incorporate additional restrictions for development activities proposed in the “environmentally sensitive” portions of the Borough. Also zoning provisions were included in the Ordinance related to “intensive agricultural operations”, and a “Planned Development” zoning district added to facilitate the proper development of one of the remaining large parcels of land in the Borough. As well as revising the Zoning Ordinance, Hanover Engineering assisted Cornwall Borough in the updating of its Subdivision and Land Development Ordinance in accordance with the Comprehensive Plan. These updates included improvements to the Borough’s plan submission and review procedures, revised design criteria, and implementation of the current stormwater management and Best Management Practices (BMPs) regulations. Hanover Engineering also prepared a stand-alone Outdoor Lighting Ordinance which was adopted by the Borough. Hanover Engineering reviewed numerous Subdivision and Land Development Plan submissions for Cornwall Borough, and performed construction observation and inspections for land developments and site improvements being constructed. In addition, Hanover Engineering provided planning and engineering consultation to the Cornwall Borough Planning and Zoning Commission and the Cornwall Borough Council.